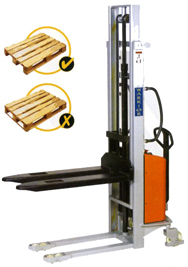 Our wide range of semi electric stackers and semi electric pallet stackers feature all the versatility and ease of use found in our manual stackers but the forks can be raised and lowered at the touch of a button. One Stop Handling supply and service Semi Electric Stackers in Dublin and throughout Ireland. Powered by a heavy duty 1500 watt electro-hydraulic power pack these units make light work of even the largest and most cumbersome pallets. Comes with a heavy duty 12v 150ah battery and a built in automatic charger as standard. Our semi electric stackers come with the usual high standard safety features including full guarding on mast, brakes on rear wheels and wheel guards to protect the operator and tandem lift chains to ensure safe lifting and lowering of pallets. Standard wrap over forks as well as wide straddle versions available across the range allowing for any type or size of pallet to be lifted ease and safety. Lift heights from 1500mm up to well in excess of 3000mm as well as minimum capacity of 1000kg. Our semi electric stackers are available in mild steel, galvanised and full stainless steel. Single and tandem wheels are available as well as a choice of rubber, polyurethane or nylon wheels depending on the surface or application. Our semi electric stackers are easily moveable under load and are versatile and easily manoeuvrable. All our semi electric stackers are fully CE rated.